frantic concerto played by Miryam and Azathoth with jubilus in outer space"
and all the women followed her, with timbrels and dancing. Miriam sang to them." Miriam is called a prophetess, and composed a brief victory song after Pharaohﾕs army was drowned in the Red Sea. Horse and rider he has thrown into the sea." the complex and dense multi-layered rhythms in "Miryam" are quite differs from rhytms originated in common Western music. "Miryam" holds every listener spellbound with expressive sound. JINMO portrayed Miryam's timbrel so brilliant and made beautiful harmony. "Ultra high frequency drones which dominate tracks, it sounds just like some magic spells. my body would be controlled under the magical rythms played by the prophetess." 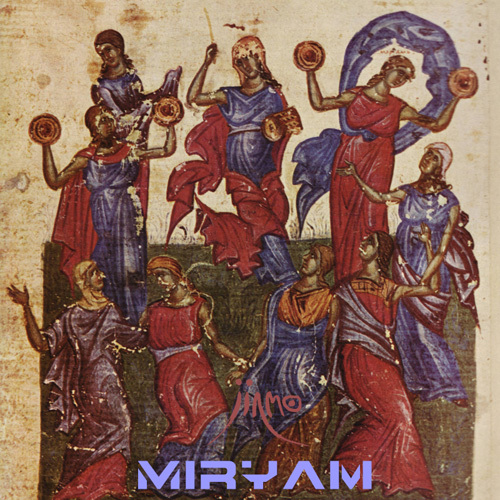 "Miryam" is intense pulse techno album filled with strong, magic power of rythms. Turn the volume at full, and let yourself overwhelmed by the fanatical, frantic pulse groove by Miryam the prophetess.